Pie chart on the stats page. *Releases*: 201 (±0) locale, 48 (+2) up to date, 7 (+1) behind by minor versions, 12 (-3) behind by one major version, 51 (±0) behind more than one major version, 75 (±0) have site but never released, 8 (±0) have no site. *Translations*: 201 (±0) total, 18 (+12) at 100%, 16 (-10) over 95%, 34 (-3) over 90%, 41 (+1) over 50%, 80 (±0) below 50%, 116 (±0) have a language pack generated, 12 (±0) have no project. *Requests*: There are 223 unresolved editor requests out of 2 442 (+16) total and 2 unresolved locale requests out of 107 (±0) total. Check out the history page to see previous stats. Todays official Release and Translation stats on the Teams page. During the last weekly check, a total of 48 487 (-255) strings were in waiting (suggested or marked as fuzzy) on GlotPress. Find global translation stats per locale on this stats page. *Translators*: There are 612 (+2) GTE, 3 075 (+10) PTE and 32 282 (+105) translation contributors. 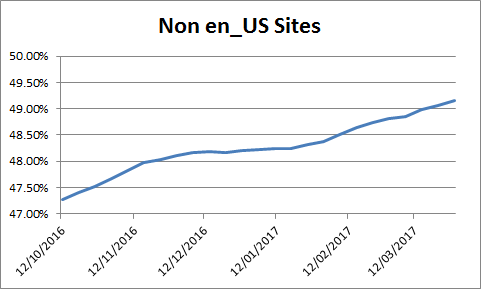 *Site language*: 53,001% (+0,025%) of WordPress sites are running a translated WordPress site.